Come wet a line at Walden Pond State Reservation. Learn about the essentials of fishing for beginners. Equipment and instruction will be provided. 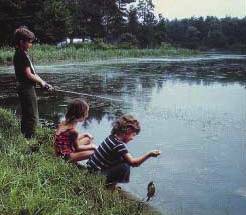 No fishing license is required for this program. This free program is open to visitors of all ages. All children must be accompanied by an adult. Please park in the main lot and meet at the boat ramp. Limited to 10 participants per day. The daily parking fee is $5.00 per vehicle. For more information, please call the park headquarters at (978) 369-3254. This entry was posted on April 16, 2014 at 1:49 pm and is filed under News. You can follow any responses to this entry through the RSS 2.0 feed. Both comments and pings are currently closed.